"I was the first one east of the Rockies to do this," Kevin says. He slides the cover of the mash tun back into place, lights a du Maurier and remembers a beer trade show he and his wife attended in the US. "These guys kept coming up to me to say 'Hi,' and my wife asked, 'What the heck's going on?' 'Down here,' I told her, 'I'm a folk hero.'" On the East Coast, brewing beer is an art. "Anyone who's doin' brewin comes to see me first," says Kevin Keefe, the granddaddy of Canadian microbrewing and owner of the Granite Brewery in Halifax. He sets his beer mug full of cold coffee aside and reaches into the 1,000 litre mash tun to give his Best Bitter mash a stir. Steam rises from the speckled foam bubbling and popping over the cracked barley grains (or grist). It's cooked for 90 minutes at 160°F (71°C) toconvert starches to sugars. Twenty years ago this April, Kevin made his first craft beer at Ginger's Tavern in Halifax at a time when it was illegal to make and sell beer on the same premises, a time when draft beer was as nondescript as tap water. When humourist H. Allen Smith sampled his first American beer and demanded of the bartender - "Put it back in the horse!" -he could just as well have been referring to Canadian draft before artisans like Kevin started the first brew pubs. In fact, he started what has become a great Atlantic Canadian success story. These days, our brew pubs and microbreweries are making some of the best beers in the world and winning international awards and acclaim. Kevin's own Peculiar Strong Ale is the most highly rated beer ever to come out of Atlantic Canada. Brew pubs like Rogue's Roost and John Shippey's in Halifax, the Pump House in Moncton, The Gahan House in Charlottetown and Duke of Duckworth in St. John's serve some of the finest craft beer on tap anywhere, and microbreweries like New Brunswick's Northampton (brewers of Picaroons), Quidi Vidi in Newfoundland, along with Garrison and Propeller in Halifax offer alternatives to the big breweries. At last, Atlantic Canada has caught up to a craft as old as civilization itself, and according to some, one that helped establish it. When ancient peoples discovered they could "store" grains in beer and bread (one German word for beer is "flussiges brot" or liquid bread) they settled down into agricultural communities. Kevin pulls a lever on his mash tun. Hot tap water squirts from a circulating arm onto the spent grains to sparge or rinse all the sugars from them. "Halifax water is some of the best for making beer," he explains. "I add a little bit of gypsum to 'Burtonize' it because it's quite soft." He flicks a switch and a pump kicks in, pulling the coffee-brown wort from the mash tun through a pipe into the copper brew kettle behind me. I climb a stepladder to peer inside and catch a waft of the steam. It's a comforting, cosy aroma evocative of childhood delights like brown bread from the oven. "Here," Kevin says, holding up an empty glass. "Catch some in this." I half fill the glass and sip the hot brown wort… liquid toffee. He holds the glass up to the light. He likes what he sees. Next, he'll add bittering hops, the flower of a vine used by brewers for more than 1,200 years to balance the sweetness of the malts and ward off bacterial infections. He'll boil the wort for an hour, then five minutes before it's finished, he'll add more hops for aroma. Then he'll pump the wort off the hops and through a heat exchanger that drops the temperature to 68°F (20°C) and into the fermentation vessel in the basement below. The basement is a disaster. I duck my head to avoid the overhead pipes and make my way past a workbench that might have dropped from the sky. A microscope competes for space with power tools, cleaners and spare parts. Firkins or kegs are scattered more or less to one side of the room. I look around at the ancient and dusty stone walls as Kevin tells me that though the place may look grizzly, the lines are clean and well-kept. He's talking about the tubes and hoses that carry the beer around the brewery and finally to the taps. Beyond the workbench, three fermentation vessels stand ready. One vessel is full of water and a cleanser to keep the vessel sterile until it's needed. Another has brown stains caked on the side. I climb a stepladder and look inside at a batch of half-fermented Ringwood Ale. It resembles a giant cappuccino with a coffee-coloured foam providing a protective yeast shield for the wort beneath. His strain of top-fermenting ringwood yeast, a single-celled micro-fungus, is particularly vigorous, converting the malt sugars in the wort to alcohol and carbon dioxide in about a week. "I've been pitching the same yeast for four years. It's a 100-year-old strain," he explains. "There's no secret sauce other than the yeast. Our yeast leaves a little fruitiness that makes our beer distinct." But he's not stingy with it. Before John Allen went on to start the Propeller Brewing Company, Kevin supplied him with Ringwood yeast for his homebrew. Once the beer is fermented, Kevin transfers it to a conditioning tank where it's cleared with isinglass, a natural agent. Later, it's racked in the firkins and barrels where some varieties are dry hopped and others further clarified. We step into the cooler where he stores his beers at 46°F (8°C), about halfway between typical Canadian and traditional English drafts. Inside, my sneakers make Velcro sounds as I walk across the floor sticky with dried beer. Two rows of firkins share the roughly constructed shelves with odds and ends-scraps of wood, spare parts, a dirty plate. A spider web of plastic tubing on the wall behind the firkins transports the beer directly to the taps where it's served. Kevin has labelled the wall with black marker beside each tube so the place looks like it was attacked by a troupe of graffiti taggers. The Granite is a dungeon compared to the glass-walled, luminously clean and spacious set up at Rudder's in Yarmouth, NS, where the equipment sits idle all winter, waiting for the American tourists to return on the ferries from Maine. It's the kind of place Kevin dismisses with a flourish. "Bah, shiny breweries," he scoffs. But Randy Lawrence who freelances as brewmaster there says it's one of the most beautiful breweries he's ever seen, all gravity fed. And Randy makes some truly excellent beer there. The Rudder's Red is smooth and malty, but it's his Yarmouth Town Brown that tops the menu. "I punched the chocolate up in it," he explains. "That chocolate has a nice roll off the tongue." Using this same chocolate malt, Randy created London Style Porter for Propeller and earned the brewery two silver medals. He spent three years at Propeller and has nothing but respect for the owner, John Allen. "He sticks to his recipes. He goes with whole hops, not pellets, and that's a sacrifice right off your bottom line. He goes for quality control." Randy is a brewer who appreciates an uncompromising, yet creative microbrewery. At his Annapolis Valley home, he brews beer that rivals anyone's for creativity, including smoked porter made from peat-smoked barley and heather ale. He uses one part heather flower tips to two parts hops-both from his own garden-for a green tea flavour to balance the malts in a red ale. For a real departure, Randy brewed maple ice bock with sap from his own stand of sugar maples. He freezes the beer then filters it into kegs. "You've got to be experimental to keep it interesting," he muses. Most brew pubs and microbreweries don't get this experimental. Aside from seasonal specials, their selection consists of four to six beers ranging from the light wheat and fruit ales to the dark strong ales and stouts. The Gahan House in Charlottetown offers a complete assortment from Coles Cream Ale and Sir John A's Honey Wheat Ale through to Sydney Street Stout and Iron Horse Brown. Brewer Trent Hayes says he favours the Island Red, as does a regular visitor from Portland, Maine. "He woke up one morning and told his wife, let's go for a drive," says Trent. They ended up in PEI where he'd tasted Island Red on a recent visit. This is the payoff for Trent. Sure, he's proud of the high approval rating his stout received in Stephen Beaumont's Great Canadian Beer Guide, but the reason he finds the business so satisfying is this kind of customer feedback. It's even more rewarding for Shaun Fraser, brewer and owner of The Pump House in Moncton, because he knows his customers are more discerning than ever. "There's never been a more educated consumer than exists now. We've turned the corner on the plastic generation. People want more of the homemade. People travel the world and see the beers at home and say, 'Why can't we have beers like that?'" Shaun is one of those world travellers. He worked for Diversified Metal Engineering, a PEI manufacturer and installer of microbrewery equipment, all over the world-from Israel to Ireland, Palestine to England, even Seaworld in Florida. He even met his wife on a trip to Kazakhstan. Beer is literally a lifelong passion with Shaun. His first name is actually Oland (his middle being Shaun) after the famous Halifax brewing family. When he was a kid, he collected beer labels. As an adult, he took up homebrewing and went on to work for a commercial brewery, then a New Brunswick microbrewery called Hans Haus and finally a brew pub. He and his wife opened The Pump House in 1999. The business grew quickly. 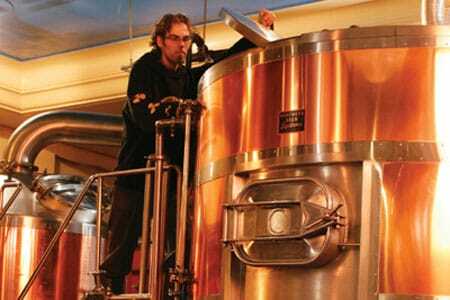 Shaun then hired Daniel Girard, another world traveller, to take over as brewmaster. Daniel worked for a brewery equipment company in Japan and completed a year-long masterbrewer's certification course in Berlin. Both men have assembled a balanced offering of six house beers from their excellent Cadian Ale to their Muddy River Stout and their award-winning dark and smoky Burn's Scotch Ale made with peat-smoked barley. "It has all the flavour I'm looking for," says Shaun. It's light in hop bitterness to emphasize the rich, dark malts and the smoky aroma and taste. Back at the Granite Brewery, Kevin Keefe has no time for such exhaustive description. "Hint of orange rind," he mocks as he sips the beer he's named after himself, Keefe's Irish Stout. "There's 5,000 official words to describe beer. I've always said, 'do you like it or not?'" I hold up the sample of stout he's pulled from one of his long-necked northern taps. They generate a creamier head, an essential characteristic of a good stout that contributes to the sensation in my mouth when I take the first sip. The liquid moving across my tongue reminding it of frothy mocha and hinting at unnameable citrus fruits feels like it could be chewed because it has what the critics call the "mouthfeel" of caramel. What lingers is a faint bitterness at the edges of my tongue that balances the sweetness of the roasted malts. I take another sip to relive the experience, and remember the words of Trent Hayes when I asked him about his stout-"You can't wait to take your next drink." As the Czechs say, "A fine beer may be judged with only one sip, but it's better to be thoroughly sure"
So I stand, sipping. Enjoying. As it should be. Soon, I forget about descriptions better suited to wine labels and paint stores. It's just me, a craft beer and the artisan who made it. No need to judge one beer better than another. You either like it or don't.